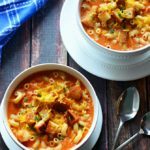 Meet my new favorite fall food. I was looking over my collection of “must make” recipe ideas the other day when I realized I still hadn’t tackled the “French Onion Soup, but not soup” request that has been sitting on the top of the list for almost a year now. It’s probably been there for so long because “Soup, but not soup” means… what exactly? I don’t think I ever had a clue. But I finally told myself that I had to stop putting off that challenge and get some French Onion goodness on my plate, immediately. Thank sweet onions I did. If I could find a fun way to combine all of the components of the soup I’d be a hero among all of my French Onion fanatic friends, but I just couldn’t come up with anything that seemed like it’d work well. That is, until I thought of the grilled cheese sticks that have been floating around on Pinterest recently. 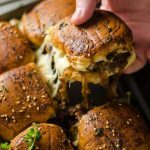 Using them as inspiration, I came up with these delicious French Onion Soup Sticks, which can be dipped in either broth or french onion dip for a delicious snack, appetizer, or lunch. My friends loved them. My family loved them. I think my boyfriend loved them, but he was watching football and freaking out at the television as he ate them, so I can’t be sure. 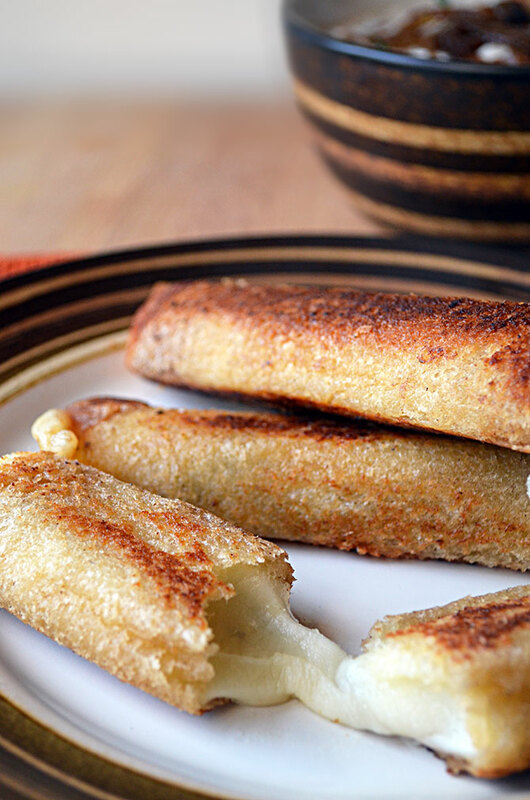 I loved them– in fact, I’ve made these three times since I first tried them. 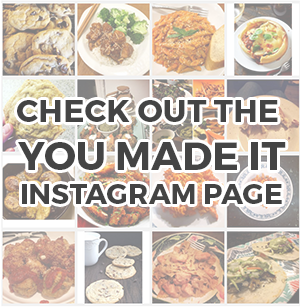 I’m sorry for taking so long to share the recipe with you, but you’ll love them, too. I mixed some of my leftover onions and some thyme into French Onion Dip and served them with that, but you can also use the broth for dipping, which is equally as tasty in my opinion! All of the delicious flavors of French Onion Soup in fun appetizer form. These sticks can be dunked in the reserved broth, or try them in French Onion Dip with some of your extra onions mixed in! Melt 2 tablespoons butter with the olive oil in a medium-sized pot over medium heat. Add the onions and stir regularly until they are caramel in color and sweet. Add the beef broth, white wine (if using) and thyme. Season with salt and pepper, and simmer for 30 minutes. Remove the onion soup from the heat. Strain out the caramelized onions and reserve the liquid to use for dipping. Cut the crusts off of each slice of bread and discard the crusts. Flatten each piece of bread with a rolling pin. Layer 1 slice (2 half pieces) of the provolone cheese on top of the bread. Line up the straight edge of each half-circle piece with the edge of the bread to cover the most area. Then, layer the swiss cheese on top. Scoop anywhere from a half to full tablespoon of the caramelized onions on top of the cheese. Tightly roll up the bread and fillings. Use a knife to cut any cheese that is pushed out at the seam. Rest the rolled sticks seam-side down. Refrigerate the leftover onions in a tupperware container. You can use them on sandwiches, in more soup sticks, or in french onion dip. Heat 2 tablespoons butter in a medium sized pan over medium heat. Once the butter has melted, add the sticks, seam-side down. 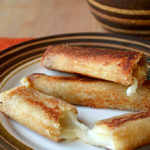 Let the bottoms become golden brown and turn every few minutes until the entire sticks are browned and the cheese is melted. Add more butter if necessary as you cook them, as they will burn if the pan becomes too dry. 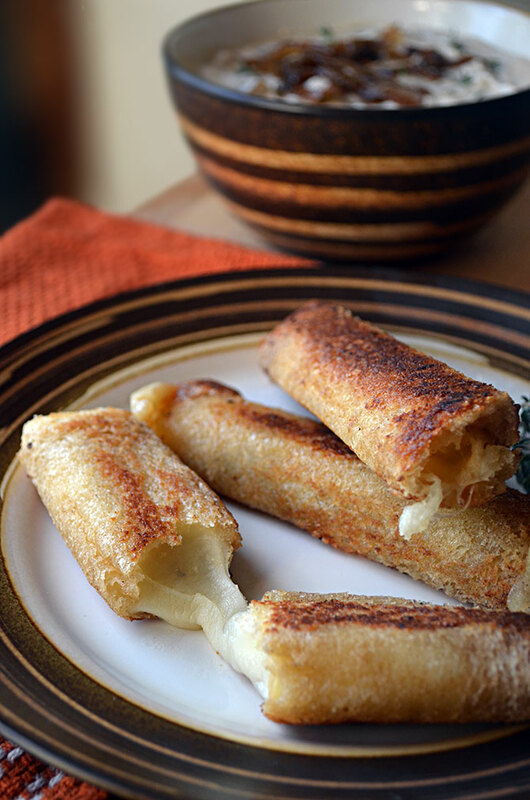 Serve the sticks warm with a side of the broth or french onion dip! Just discovered your blog via Reddit – love it! I have tried something similar before (making homemade bread with the caramelized onions and then making a grilled cheese with the dipping sauce) but your version is SO much quicker! I tried it yesterday and everyone loved them. 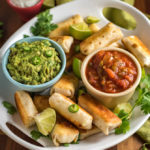 It is a quick,easy, and delicious snack that is super creative and impressive. I’m so glad everyone enjoyed them, Shaunna, and thank you for letting me know! OK, so for some reason after i updated this the total cooking time changed. I probably read it wrong first. Sorry. good Recipe. No, you didn’t read it wrong. I had a typo which I fixed earlier today and it probably just took a little while to post on the blog. Don’t worry, it’s not you, haha! This sounds great but could you or someone please clarify step 7? I’m confused about the rolling up, I thought it would be just like a grilled cheese. Also, seam side down? I tried to take pictures of the process but they didn’t turn out great so I didn’t post them, I’m sorry. 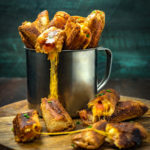 I got this idea from grilled cheese rolls, though, and there’s a good photo demonstration of how to do it here. I hope that helps! I also found you via Reddit….now I pinned these to Pinterest…gotta love it! Thanks, Melissa! Just checked out your blog– great stuff!! 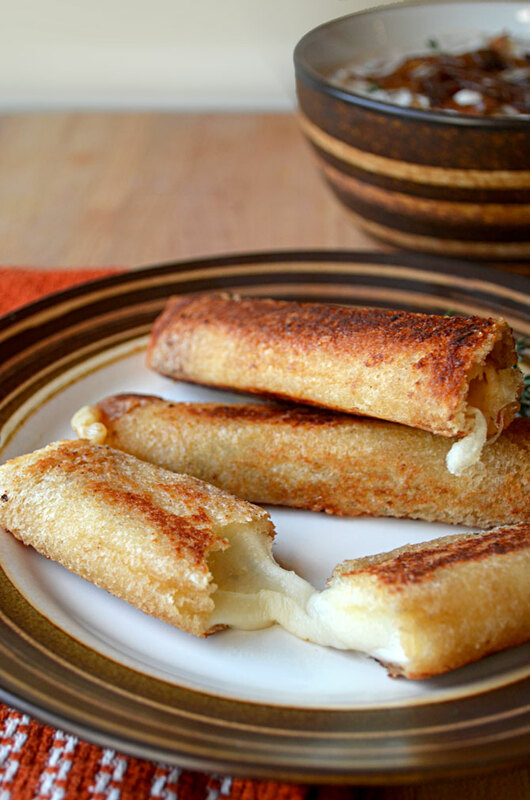 I just made these for dinner…. seriously delicious and ingenious! Thanks for letting me know, and I’m happy you enjoyed them! Morgan, these look so good right now. I think I’ll use sourdough bread for these and make a batch this weekend! Came across your Pinterest image and am enjoying the site, thanks!